I had been hearing for a while that this whole story actually "broke" on an Alan Rickman fan site. Well now I have located the link. (Scroll down to "2/22/06 9:28am"), May not be new to everyone out there, but I found some things fascinating about this. 1) The post is dated February 22. It describes Nicola confirming the cancellation the previous day, February 21, one full week before the story first publicly broke in the NYT. 2) The poster confirms the "Telecharge" part of the story (i.e. 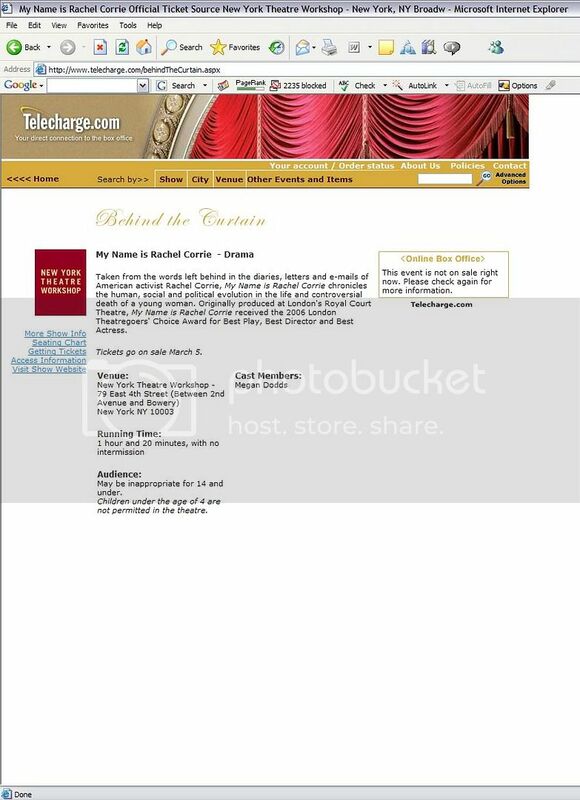 that it was up there), and provides links to screen-cap images. This one is particularly interesting because it describes plans for post-show discussions "following every performance" and "with a variety of artists, journalist, and cultural commentators." Hm. What to make of this. Obviously Nicola was true to his word about making plans for "contextualization" but seems to have been farther along than even he admitted. Is he saying he didn't have time to book anyone? Can you believe it's that hard to get "artists, journalists, and cultural commentators" to speak in public? 3) The poster, obviously, is a big Rickman fan, and so was calling the theatre every day for info on tickets, etc. He/she does encounter at first a little vagueness from NYTW on just how "definite" all the plans are. (This is mentioned as "last week," so mid-February.) But, as you'll see, the theatre clearly implies they expect the show to go on as scheduled. 4) Then, an "awkward conversation" on February 21 where the poster is told the play has been "indefinitely postponed". That's "indefinitely." The poster then emails Jim Nicola himself, who does write back saying, ""We have postponed the production indefinitely," and , "I think it is unlikely for a NY production in the next few months." Remember this seems to have been his first public comment, even if to one individual. I leave it to you to square that with his statements since. Ok, here's the whole post, only slightly copy edits and trimmed for relevance. (But again the raw text is here (under "2/22/06 at 09:28 am"). Keep in mind the context that this is addressed to fellow fans of Alan Rickman. Also, I'm inclined to trust the accuracy of the direct quotations, since this being written the very next morning. ...Over the past three weeks [Feb 1-21? 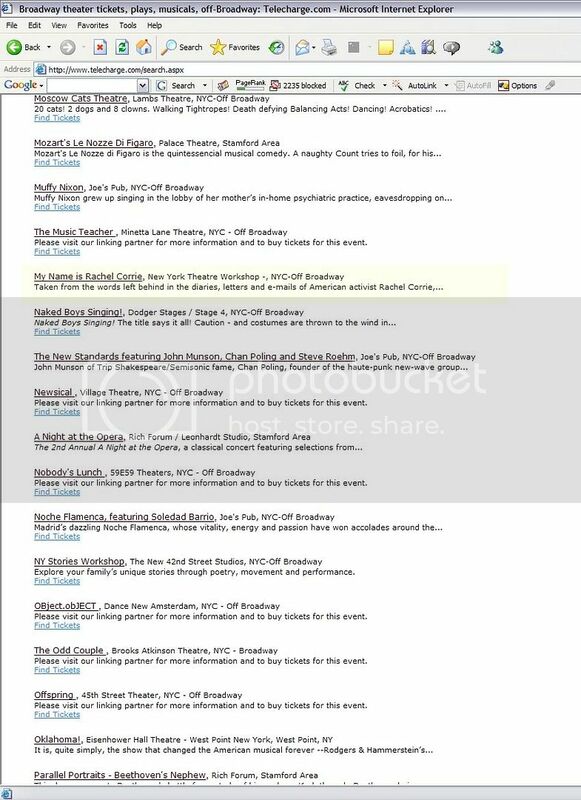 -Playgoer] I have been in contact with the New York Theater Workshop. I had established contact with them via email, and throughout those conversations they had indicated that nothing was 'definite', but that announcement was to be forthcoming this week. I had also been calling them once per week just as a double check, and each time I called, they said nothing was 'definite', but early last week they gave a strong indication that an 'announcement' was coming late last week, or this week. 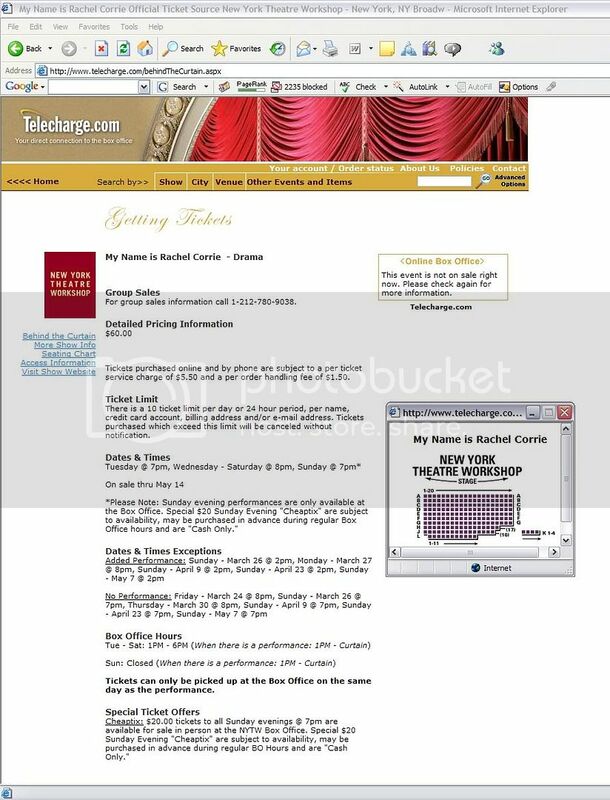 NYTW sells their tickets via Telecharge, so I was also checking the Telecharge site on a daily basis. Yesterday, I was elated to find that a full listing for MNiRC, with preview and play run dates, ticket information, as well as info on post-talk discussions with post-performance discussions after every show, (woot!) featuring a variety of artists, journalists, and cultural commentators (details were not provided). 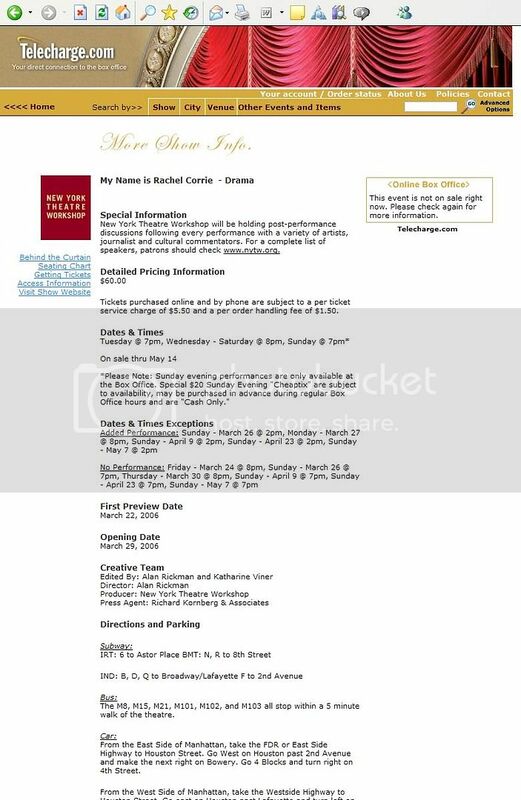 I then called New York Theater Workshop to inquire about these post-talk discussions and to discuss the best method for obtaining tickets. postponed the production indefinitely. We were unable to make it happen in the very tight time frame that emerged. It may be reappearing in London." this point. His response was as follows, "I really donÂt know. I think it is unlikely for a NY production in the next few months. London seems more possible." ready to go on Telecharge, etc). Timing (OOTP?). Political? So NYTW uses the word "indefinitely." And it appears the "contextualization" had already been scheduled. Which means this appears more than ever to be what Harold Pinter calls it: "self-censorship." It also is interesting that Nicola seems to leave open the possibility to the Rickman person that the play might find a different New York home. This makes his insistence that NYTW asked for a "simple delay" seem like a flat-out lie. If he'd wanted a simple delay, why didn't he ask for one? Why did he tell the Royal Court it was "indefinitely postponed?" The simplest answer is, he was artfully cancelling the show and never planned to do it again. Which makes his protests to the contrary once the story hit all the more appalling. Think what David Hare could do with Nicola's conflicting statements alone. "Stuff Happens 2." "We all remember the old joke about the borrowed kettle which Freud quotes in order to render the strange logic of dreams, namely the enumeration of mutually exclusive answers to a reproach (that I returned to a friend a broken kettle): (1) I never borrowed a kettle from you; (2) I returned it to you unbroken; (3) the kettle was already broken when I got it from you. For Freud, such an enumeration of inconsistent arguments of course confirms per negationem what it endeavors to deny - that I returned you a broken kettle..."